This section is devoted to manual Pizzelle Irons of all types which have been used throughout the years to make cookies. *Use your browser's "Back" button to return to this page. Sorry if the museum loads a little slow with all of the photos. More wings to be coming soon on other pages so check back often for the latest inventory or a whole new wing of the Online Museum! 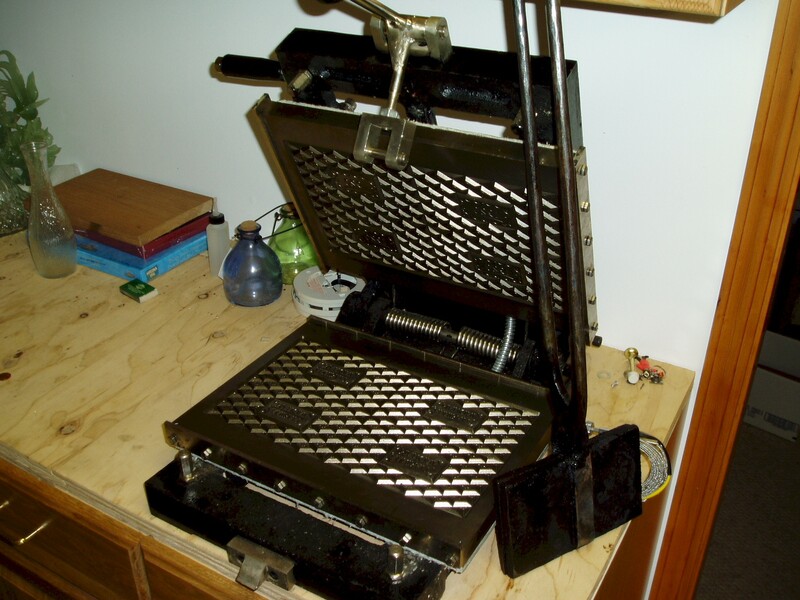 If you have photos of an Old Pizzelle Iron, own the rights to the photos, and agree to their publication on the Internet, please contact me. I bought this old "Rossi" Iron on eBay to add to the collection. It is very distinctive in that it is round with a very ornate inlay on each plate and the name "Rossi" in script on one of the plates. This is also a very unsual latching system with a serrated/graduated latch. Cast Iron Pizzelle Iron Marked "PAT. J.C. 26.81. Another Cast Iron Pizzelle Iron obtained on eBay. This is also very distinctive on the inside. Latching Mechanism on the Cast Iron Pizzelle Iron Marked "PAT. J.C. 26.81. There are many Latching Mechanisms on old Pizzelle Irons. This is the inscription on the Pizzelle Iron Marked "PAT. J.C. 26.81. I think the J.C. has Religous overtones based on the cross on the inside. Inside of Cast Iron Pizzelle Iron Marked "PAT. J.C. 26.81. I think this makes one large cookie with two impressions of Christ on the Cross. Another Large Rectangular Iron Marked "Tony Morelli Youngstown Ohio" on one plate and "T.M. 1921" on the other. Tony Morelli Iron with plate and "T.M. & 1921"